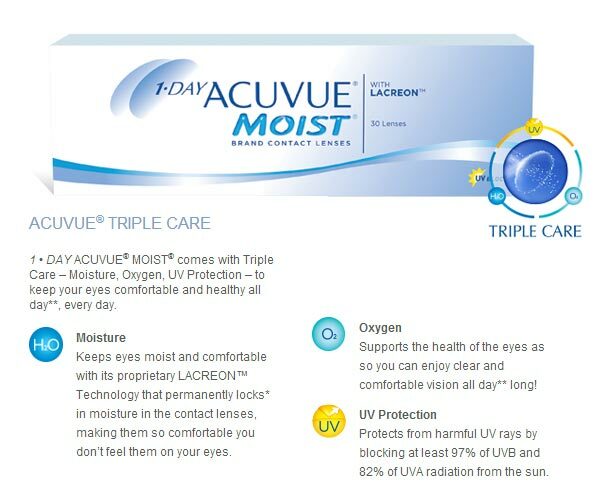 1 • DAY ACUVUE® MOIST® is the only daily disposable contact lenses with proprietary LACREON™ technology which locks* a moisture-rich agent that acts just like natural tears, into the proven Etafilcon A material. As a result, your eyes feel fresh and remarkably comfortable, all day long! Keeps eyes moist and comfortable with its proprietary LACREON™ Technology that permanently locks* in moisture in the contact lenses, making them so comfortable you don’t feel them on your eyes. Supports the health of the eyes as so you can enjoy clear and comfortable vision all day** long! Protects from harmful UV rays by blocking at least 97% of UVB and 82% of UVA radiation from the sun.